The Hickory on the River, by Woodland Stays! The Hickory on the River, by Woodland Stays is a newly renovated one bedroom home on the Merrimack river. Large open concept with a kitchen to inspire you to cook. 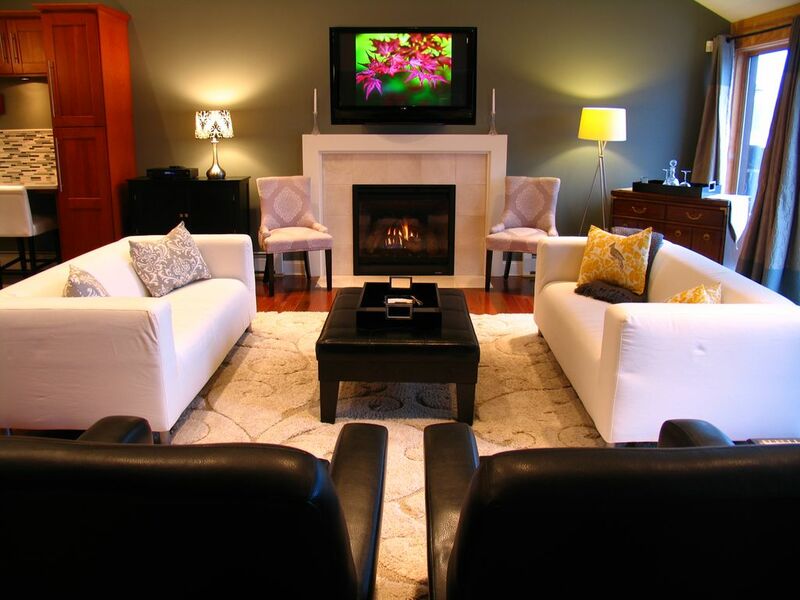 Living room features a gas fireplace (available November 1 - March 15) and a 50 inch plasma TV. With the beautiful view, you will forget that you are 5 minutes from down town Manchester. The beautiful kitchen is completely outfitted with everything you need to cook a simple breakfast or a gourmet meal. We supply the kitchen inspiration, you supply the food! Feel free to use our cabinet full of spices and condiments in the fridge. Living room features a gas fireplace (available November 1 - March 15) and a 50 inch plasma TV with plenty of seating and huge ceiling fan. The bedroom features a 4 poster bed with brand new Tuft & Needle mattress, #1 rated mattress in the world, and fine linens. Master bath, stocked with towels is attached to the master bedroom. A second half bath is located off the foyer entrance. The Merrimack river view is breathtaking all year long, from the kitchen, living room and dining room. The deck is enjoyable seasonally with patio table and chairs, a swing, propane fire pit, and propane barbecue. However it is not available during winter months, as it is slippery. Extended cable, secured wireless internet, and washer/dryer for your convenience. This main home is attached to an apartment, however, both units are completely private. Our guests enjoy their privacy, however, we are always available by email, text, or phone. We respect our guests' desire for privacy, so more than likely you will not see us. But please, be honest with the number of guests who will be staying. You will not be able to 'sneak' people in without being noticed (exterior security cameras). Lets not make an awkward situation for any of us. Thanks! NH Tax ID License #059863 Booking at my rental ensures that you are booking with a legal host ... one who pays the Short Term Rental Tax required by the state. Physical License is posted in the home. I have worked in the hospitality business for over 30 years. So hosting is in my blood. My company, Woodland Stays was launched in 2012 with just one home and now we have 9! We strive everyday to ensure all of our guests experience a comfortable, enjoyable and memorable stay. I also own and operate a motel and seasonal restaurant in Epping, NH. So my life is very full and there is never a dull moment. My husband Peter was crazy enough to join my companies in 2005. I am the face of the companies, but Peter is the glue that keeps it all together. When we can escape for some rest and relaxation, we enjoy our home in sunny Cape Coral, Florida ... where the cocktails always taste better poolside. Beautiful property, perfect for our New Hampshire reunion. Donna Boutin has elegantly decorated this beautiful riverside home. She provided not just the basics, but many personal extras you wouldn't find elsewhere such as kitchen accessories, condiments, bathroom supplies/toiletries, etc. She left an information pamphlet covering local stores, eateries, and sites of interest, which was much appreciated. The house itself is gorgeous, with grand window-wall views up and down the Merrimack river. This was the perfect home for our vacation. We were revisiting New Hampshire after a 20-year absence, and really appreciated the warm and welcoming nature of the house. We were also preparing for a subsequent Thanksgiving get-together and took advantage of the fully equipped kitchen to do our early cooking and baking. We would recommend this home to anyone. Great property, so well furnished. The kitchen and living room are amazing, with a beautiful deck right on the river. We loved being able to drive north to the White Mountains and East to the Sea. Donna was very helpful to us. This is a wonderful place to stay. The house is roomy, clean and it has a fully stocked kitchen for all your needs. It is as pretty as the picture. We stayed in December, but we still enjoyed the river view out the big sliding glass windows. We hope to be able to go back and rent again sometime. Fabulous 1 bedroom with attached master bath, king size bed with memory foam was a dream to sleep on. The kitchen was equipped with everything you could possibly need to entertain up to 12 people including lobster pot and crackers/tools. Full size barbeque on the huge deck with a gas fire-pit and comfortable deck chairs facing east steps from the river. Great spot to sit and have a coffee watching the Sunrises on the water. Watch for bald eagles flying by as they sometimes perch in the large pine tree's across the river. Living room with fireplace and flat screen TV with large dining room provided a great spot to entertain. Extra 1/2 bathroom off the kitchen and an upscale washer dryer are great for longer term stays. Highly recommend staying here! . *This rental is for the enjoyment of the registered guests only. 1. For liability reasons, guests may not bring any visitors or any others to my home at any time, for any length of time. Only those individuals who are registered guests, whose full names have been provided in advance and who have been paid for in advance, may enter the premises. No other individuals may be on my property. Strictly enforced with exterior security cameras. 2. No smoking, no pets, no parties. 3. Shoes off at the front door. 4. Heat is allowed to be used to a max of 72 degrees. Heat should be lowered to 68 when not in the unit. Heat Level is strictly enforced with exterior security cameras and Wi-Fi enabled thermostat. Electric portable heaters are not allowed. 5. In the case of significant violation of house rules, the reservation will be immediately terminated and all fees and monies paid will be forfeited.